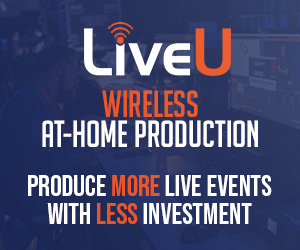 LAS VEGAS, NV (April 7, 2019) – Panasonic System Solutions Company of North America is showcasing advanced products and technologies for live production here at the National Association of Broadcasters (NAB) show. 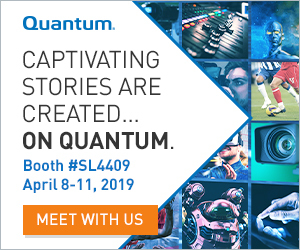 Visitors to the company’s NAB booth C3607 can preview the future of live production in the Smart Studio, a set demonstrating the sophisticated features of the AW-UE150, Panasonic’s new 4K/HD pan/tilt/zoom camera, in integration with virtual systems. The key products on this live set include Panasonic’s 8K ROI system, which allows one camera operator to access the 8K camera’s super-wide field of view and HD windows with full PTZ control and follow the action from multiple virtual camera angles, saving space over multiple manned cameras. The 8K ROI system will be teamed with the real-time BlackTrax tracking system to automatically track moving subjects on the set with shots perfectly in frame and ready to take to program. Panasonic’s AW-UE150 4K/HD PTZ will be demonstrated with Tecnopoint Tuning software, Totem telescopic column systems and motorized floor and ceiling dolly systems, bringing more axes and another dimension of movement into the live production. With the UE150’s freeD support (for integration into virtual systems), a scene can be digitally mapped, allowing for tracking of subject movement with the camera and Tecnopoint systems, all while coordinating the live on-screen display of an AR object or scene through a Brainstorm server. the prototype of a new 4K P2 shoulder-mount camcorder. on the exhibit’s presentation stage, presentations and panel discussions will be held on new technologies and products. Leading cinematographers and broadcasters (including William Wages, ASC; DP Elle Schneider; TBN’s Director of Network Operations Larry Haley; Loyola Marymount University’s (Los Angeles)’s Director of Broadcast Production Patrick Alcerro) will discuss projects shot with Panasonic cameras. The presentations will available on Panasonic’s Facebook page, @panasonicprovideoUSA. Visit panasonic.com/us/NAB2019 to view the full schedule of presentations at the show. Panasonic will also be demonstrating its NDI®-based pan/tilt/zoom cameras at the NDI® Central Pavilion at booth SL5616. For more information about Panasonic professional video products, visit http://business.panasonic.com/products-professionalvideo or contact Panasonic at 877-803-8492.
and manufactures reliable, flexible and dependable products and solutions to help create, capture and deliver information of all types, especially where, when and how it is needed. The complete suite of Panasonic professional solutions for government and commercial enterprises of all sizes addresses unified business communications, mobile computing, security and surveillance, retail point-of-sale, office productivity, audio and visual systems (projectors, displays & digital signage) and professional video production. To learn more and Panasonic’s business products and solutions visit https://na.panasonic.com. Newark, NJ-based Panasonic Corporation of North America is committed to creating a better life and a better world by enabling its business-to-business customers through innovations in Sustainable Energy, Immersive Entertainment, Integrated Supply Chains and Mobility Solutions. The company is the principal North American subsidiary of Osaka, Japan-based Panasonic Corporation. One of Interbrand’s Top 100 Best Global Brands of 2018, Panasonic is a leading technology partner and integrator to businesses, government agencies and consumers across the region. Learn more about Panasonic’s ideas and innovations at www.na.panasonic.com/us.